No, I'm not making this up. Yes, I would so purchase these if I had a girl. Briana, Miss Olive needs these. 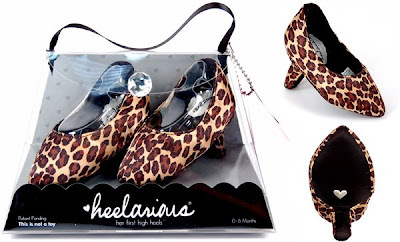 $35.00 for "Leopard satin heel with black satin lining for infants size 0-6 months. " If Leopard's not your thing, they've got several other color options. Those are adorable. Again my daughter is too old for them, though. OMG. I don't think Miss Olive will be getting any of those! So not my thing.